Congrats Poker Patriots! Step In The Right Direction. With the Democrats taking the House – and possibly the Senate – in yesterday’s mid-term elections, a clear message was sent to the Washington insiders and special-interest groups: Don’t Mess With Texas Hold’em! 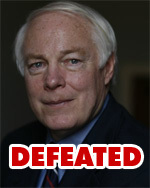 Jim Leach [R-IA], one of the architects of the Unlawful Internet Gambling Enforcement Act, lost his seat in Congress to Democrat Dave Loebsack. So thanks Iowa! Good on you for standing up to this self-proclaimed “moral arbiter.” Unfortunately, Rep. Bob Goodlatte [R-VA] and Senator John Kyl [R-AZ], two other architects of the UIGE retained their seats, but Bill Frist [R-TN] didn’t run so he’s out [though he hopes to be President some day…]. There’s a good article over at CardPlayer and one at PokerNews as well. Leach sat on the Financial Services and International Relations committees, so this means new people will fill his seat – hopefully those with better credentials and a broader outlook on what should be regulated and how far national powers should extend into the lives of everyday Americans. The job is nowhere near complete – the fight must continue. We’ll continue to cover the fallout from the election and the changes it will herald. More from Gambling Legislation | Comments Off on Congrats Poker Patriots! Step In The Right Direction. eCOGRA [eCommerce and Online Gaming Regulation and Assurance], the online gambling industry’s independent player protection and standards authority, has offered consulting services to the UK DCMS [Department of Culture, Media and Sport] regarding the current move to regulate online gambling in Europe. No word yet from the UK as to whether they’re interested. It’s an interesting move by eCOGRA. They are one of the larger self-regulating bodies in online gambling, though they were founded by and are led by the major operators in the industry including OnGame, MicroGaming and 888 Holdings. It truly is an insiders club more than a regulating body but let’s not split hairs. What they’re doing is in their own best interest, but also serves the industry as a whole. If they can assist the UK/EU in establishing regulation, everyone will benefit, including players. eCOGRA put out a press release you can read here. The latest initiative of the Association of Professional Casino Webmasters [APCW] is Perspectives Weekly, a short news feature covering the online gambling industry, and it’s certainly of interest to all players, affiliates and operators. The APCW are truly working their hearts out to make online gaming safe and legal in the USA. The premiere episode focuses on the new gambling prohibition, the relative silence from most of the online casino operators, and the impact of American federal law on state gaming laws. You might notice that Poker Patriots is featured at the top of the piece. A big shout out to the APCW for associating with Poker Patriots. Part of our mission is to build partnerships with other organizations like the APCW to contribute to positive change. We believe Americans should have the freedom to play, bet, wager, or gamble on their favorite games of skill and chance, be it poker, blackjack, bingo or backgammon. The Association of Professional Casino Webmasters [APCW] has produced a series of short videos highlighting the issues and controversy behind the Internet Gambling Prohibition Bill. The fourth video is a simple plea for you to assist those politicians afflicted with CDD. They need your help today… before it’s too late. The Association of Professional Casino Webmasters [APCW] has produced a series of short videos highlighting the issues and controversy behind the Internet Gambling Prohibition Bill. The third video pokes a bit of serious fun at Senator Bill Frist. [ed. note: or as we like to call him “Freeloading Bill”].